I really wanted to crank this post out before the fresh citrus disappears from grocery store shelves. There is nothing like in season citrus to make any recipe sing. These scones are nice and tasty and go well with tea, coffee, or are a great anytime snack. I made them a while back for a tea party and they were a huge hit – especially when paired with clotted cream. When these were made I used an electric mixer, however you can mix these by hand, it will just take some elbow grease. Otherwise as scones go this is a fairly basic recipe. It does take some time and work but like most recipes is worth it in the end – especially when you are looking for a vehicle for clotted cream. If you need a use for the remainder of the orange I highly recommend the beet and orange salad on this site. Or just eat the orange as-is, up to you. Wash the outside of the orange to remove any possible pesticides and wax and dry it. Using a grater, zest the peel of the orange. You only want the orange parts, not the white pith. Set aside 1 tablespoon of the zest. In a bowl whisk the eggs so they are well beaten and set aside. Measure the cup of cranberries and ¼ cup of flour into a bowl and mix gently to coat the berries. Right before you are ready to start mixing everything, cut the butter into a dice. Taking one stick out of the fridge at a time, cut it lengthwise into three long pieces, turn on its side and cut into three pieces, then cut down the length to make small pieces. Set these aside. In a large bowl stir the flour, sugar, baking powder, salt, and orange zest together. Add the butter to the bowl and mix at a low speed (or gentlyly if by hand) until the butter is the size of peas. This means the butter will not be fully incorporated into the flour mixture, but only partially. Add the heavy cream to the eggs and mix the two together. Gradually add the cream and egg mixture to the flour and butter, mixing on low speed. Add to the dough the floured cranberries and mix until just combined. At this point the dough should look lumpy, and you will still see pieces of butter throughout. Flour a clean countertop or cutting board and place the dough on it. Gently knead the dough into a ball. Take a floured rolling pin and roll the dough so it’s about ¾ of an inch thick. Use a floured cookie cutter or biscuit cutter (about 3 inches) to cut out the scones. If you don’t have a formal cutter you can flour the top of a cup and use that to shape the scones. Any dough scraps should be combined and re-rolled to cut more scones. Place the scones on a parchment-lined baking sheet about an inch or so apart and bake in the oven for 20-25 minutes. 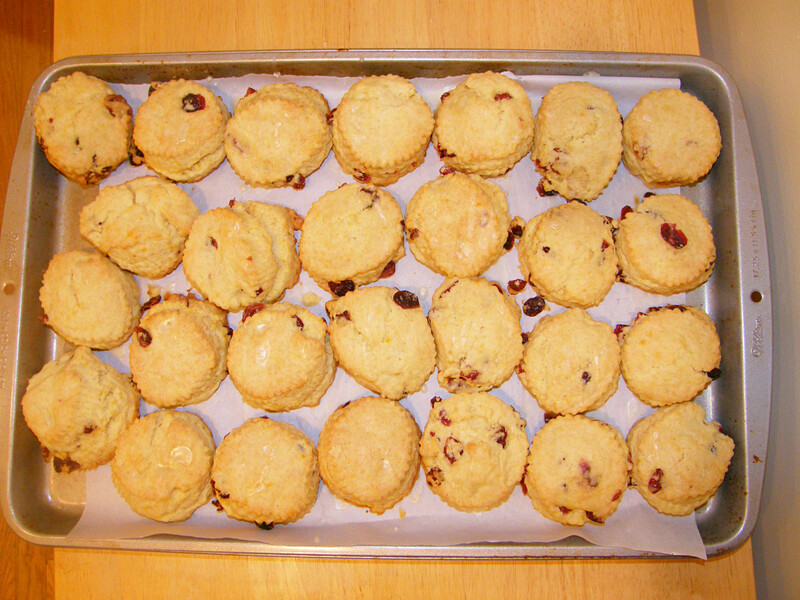 Allow the scones to cool, serve and enjoy! I love it when a delicious recipe is beyond stupid easy. It makes me happy. Why should good food have to be difficult? This banana bread recipe is as easy as it gets when it comes to baking. The best part is you can add goodies like chocolate chips and walnuts to it to add flair. 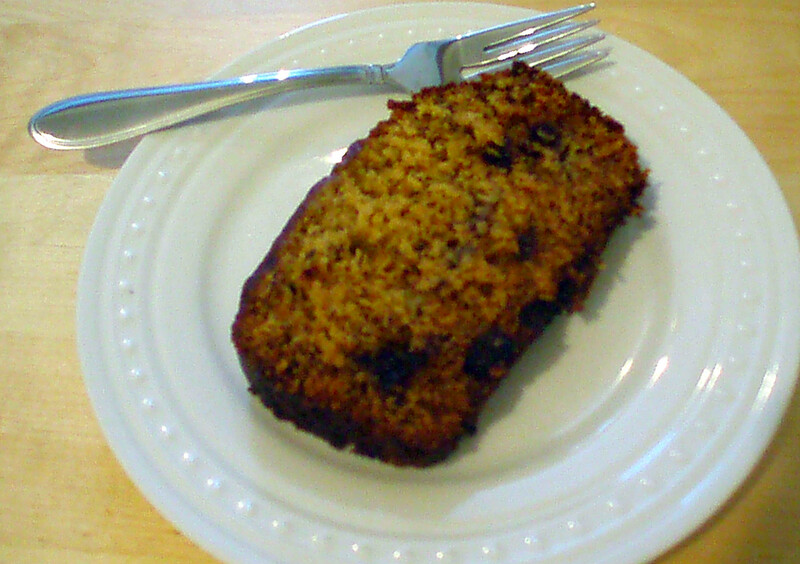 When baking with bananas you want them to be over ripe, but not yet rotten. It’s a fine line. But a banana with lots of brown spots usually is perfect for baking. You want it to be super ripe and soft so that mashing it is easy. An hour before baking set out the butter to soften. Using spare butter grease a loaf pan (about 8 x 3½ x 4 inches) on all sides. In a bowl mash the bananas with a fork until they are well mashed and gooey. Set aside. Break the eggs into a small bowl, making sure no shells fall in with the eggs. Then beat the eggs with a fork and set aside. Measure out the yogurt and set aside. In a large bowl beat the butter with a fork until creamy. Add the eggs to the sugar and butter and mix until fluffy. In a separate bowl combine the flour and baking soda. With a spatula stir in 1/3 of the flour to the butter and sugar and mix until incorporated. Next add the yogurt and stir until mixed in. Add another 1/3 of the flour and stir until mixed in. Add the bananas to the bowl and stir until well incorporated. Add the last of the flour and stir until well mixed. Add to the bowl the chocolate chips and/or walnuts if you are including them and stir until they are mixed in. Pour the batter into the greased loaf pan and bake in the oven for one hour. Allow the bread to cool in the pan before serving and enjoy! Here it is again, that line between breakfast and dessert. Just earlier this week we were discussing at work how muffins are really just cake in a funny shape. It’s true that many breakfast sweets really are just desserts in a poor disguise. I like that this recipe is honest about what it is. It’s a cake. That you eat for breakfast. I also like that its pumpkin, a lot. Now not everyone owns ramekins, so there are some possible substitutes. One option is to use a large muffin tin (one that would make huge muffins). Another is that you can use oven-proof mugs or bowls. These should be made of stoneware, as traditional coffee mugs may not hold up. It’s important to note that just because a mug is microwave safe it does not mean it is safe to use in the oven. I did also make one change to the recipe regarding “topping” the cakes. The original recipe calls for a glaze made with powdered sugar and maple syrup. I decided to just use straight maple syrup and cut back on the sugar, but you can still do the glaze if you’d like. The cakes are not too sweet so the additional sugar won’t overwhelm them. Just make sure to use real maple syrup and not that nasty corn syrup stuff that comes in a bottle shaped like grandma. About an hour before you plan to bake, take the butter out of the fridge so it can warm up to room temperature. Right before you prepare the recipe preheat the oven to 350° Fahrenheit. Grease the inside of two ramekins. In a mixing bowl cream together the butter and the sugar until well mixed. Add the egg and stir well until the mixture is combined. Add the vanilla and pumpkin and stir until the pumpkin is completely mix in. Add in the two kinds of flour, baking powder, salt and spices. Stir the mixture well until everything is evenly mixed and no flour remains on the edges of the bowl. Pour the mixture into the two ramekins, making sure they have even quantities. Place the ramekins on a baking sheet and then bake in the oven for 30-35 minutes, or until a toothpick placed in the middle comes out clean. Mine needed to bake for the whole 35 minutes, but it can’t hurt to check the cakes after 30 minutes. 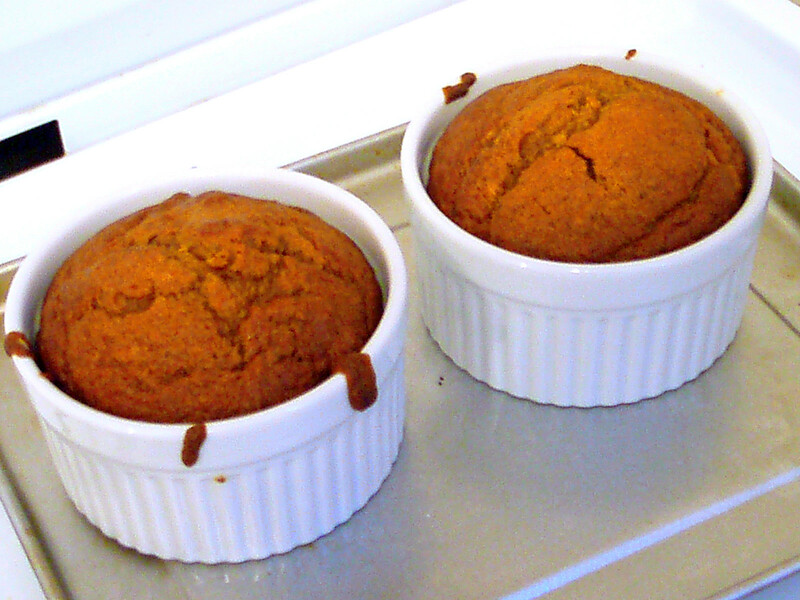 Allow the cakes to cool for at least 15-20 minutes before carefully removing them from the ramekins. Place the cakes on plates, drizzle with maple syrup (as much or as little as you like), and enjoy!